Anytime I go to a sporting event, concert, fair or other show, I always look forward to chowing down on one (or two) of the large, piping hot, soft pretzels for sale there. I am such a bread lover and have to admit that I could eat these soft pretzels all day long. I have even went so far as to buy the frozen kind in your grocer's freezer, but didn't think they compare to the ones for sale at big events. 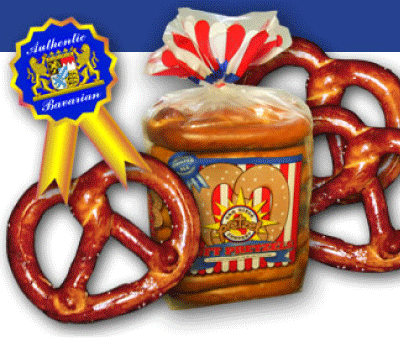 San Diego Pretzel Company has been offering fresh, handmade, soft pretzels for sale on their website since 1995. Would I finally be able to enjoy the wonderfully old-fashioned flavor of a soft pretzel in my own home, anytime I want? Keep reading to find out! I reviewed the 8-Pack Bag of 5-Ounce Twisted Traditional Bavarian Pretzels from the San Diego Pretzel Company, which retails for $25.95. I was so excited when the package of twisted traditional Bavarian pretzels from the San Diego Pretzel Company arrived at my door, for I couldn't wait to tear into this bag and see how good they tasted. It is recommended that, upon receiving your pretzels, they are placed back into the freezer for they only have a 7-day shelf life at room temperature. Once frozen, these pretzels will keep for a long time so you can have them ready whenever you are craving one of these yummy treats. It was so easy to prepare one of these pretzels to eat and I was really amazed at how quickly you could do so. All you need to do is spray the pretzel with water or brush it with melted butter. I definitely chose the melted butter option for I wanted to see if this pretzel would taste just like the ooey, gooey and chewy soft pretzels I was craving. Next, sprinkle your pretzel with a little of the pretzel salt which is included in your package. I was shipped two packets of resealable pretzel salt for my 8-pack of 5-ounce Twisted Traditional Bavarian Pretzels. I liked that you were in control of the salt amount. One thing I don't like about buying pretzels at big events is that they are absolutely COVERED in salt. I think with pretzel salt, less is more, and so am glad that I can regulate this myself. Also, if you happen to be on a low-salt diet, you can opt to eat your pretzels with no salt at all. Next, simply pop the pretzels in a 450-degree oven for one minute or microwave for 30 seconds. If you are preparing frozen pretzels, just double the cooking time. I chose to put my pretzel in our toaster oven and one minute later, my taste buds were doing a happy dance. I have to say that these pretzels from the San Diego Pretzel Company actually tasted BETTER than the ones I purchase when I attend large events! I was shocked for I would have been thrilled if these pretzels just tasted as good as the ones I'm used to eating. They tasted so very fresh and I liked the flavor of the dough better too. Of course, I also love that these pretzels are composed of all natural ingredients and contain no preservatives, trans fats or hydrogenated oils! If you have a hard-core soft pretzel lover on your Christmas list this year, then don't hesitate to make them happy with a bag of pretzels from the San Diego Pretzel Company! With so many delicious flavors and styles to choose from, I'm just sure they will thank you all year long for their gift. Personally, I hope Santa leaves a large bag of the Philly Pretzels under the tree for me! Disclosure: I received the 8-Pack Bag of 5-Ounce Twisted Traditional Bavarian Pretzels from San Diego Pretzel Company in order to facilitate my review. No other compensation was received. This product review is based on my own personal experiences with this item and is completely honest and objective.